Julia right from a young age. Celebrated Portsmouth artist, Julia Pankhurst, has always known she had the gift for painting. After leaving Epsom Art School, Julia spent several summers earning a living as a portrait artist, however, a lack of direction caused the painting to fall by the wayside. Whilst working in the Portsmouth Naval base, in 2010, Julia surprised everyone by painting her first seascape featuring HMS Ark Royal – ‘All Quiet at Twilight’. Its success encouraged her to paint a collection of Naval ships culminating in her being commissioned to paint the final picture of HMS Illustrious, prior to her being decommissioned in 2014. 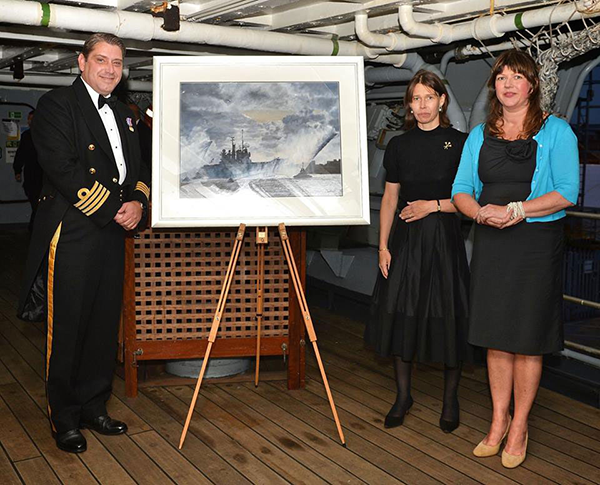 That original painting was presented to Lady Sarah Chatto, (the Queen’s niece), on the quarterdeck of the aircraft carrier by Julia and the ship’s Captain. In 2017 Julia was commissioned by BAE Maritime Services to paint the official handover painting of HMS Queen Elizabeth in celebration of her being commissioned into Her Majesty’s Royal Navy. The original painting was presented to the ship’s Captain and is now displayed on board in the ‘Flag dining room’ – where Royalty and dignitaries will be entertained for the duration of the ships service. Living by the sea has given Julia a real love and appreciation for nature and the outdoors and this is no more evident than in her collection of characterful animal portraits and seascapes. Her ability to capture the energy of the sea is getting her quite a following both in the UK and further afield. Whether it be a mischievous highland cow, or the energy and the ever-changing mood of the sea, she always interprets it in her very own realistic, big, bold and vivid style, which captivates the viewer. Last year an exhibition in the local seaside town of Gosport only served to reaffirm her popularity in the area and a spate of shows and exhibitions in 2017 has made her a lot of friends and fans up and down the country. Julia now has an art gallery/studio in the Hampshire town of Waterlooville, where she is constantly expanding her diverse portfolio. Her preferred medium is acrylic on canvass and her paintings are available in different sizes as canvass or paper prints.